The 1903/04 Younghusband expedition to Tibet has often been described as the last of Queen Victoria’s ‘little wars’. Although Her Majesty had passed away a few years before the adventure, it certainly bore all the hallmarks of a typical Victorian colonial army venture. A key feature of such wars, I’ve always felt, was the clash of cultures. The Zulus, Maoris, Sikhs, Egyptians and Chinese had cultures utterly distinct from the British, and indeed from each other. Globalisation and the modern world would steadily erode these differences but significant ‘first contact’ moments with these disparate peoples were often of a military nature. The Tibet expedition yielded a clash with a people utterly different to the British, and quite distinct even from other nations of the region. The stark nature of these differences was brought into sharp focus with the use of modern western weaponry, in particular the Maxim machine gun. It was a struggle to manage at times in the extreme cold but was nonetheless devastatingly effective against Tibetan swords. 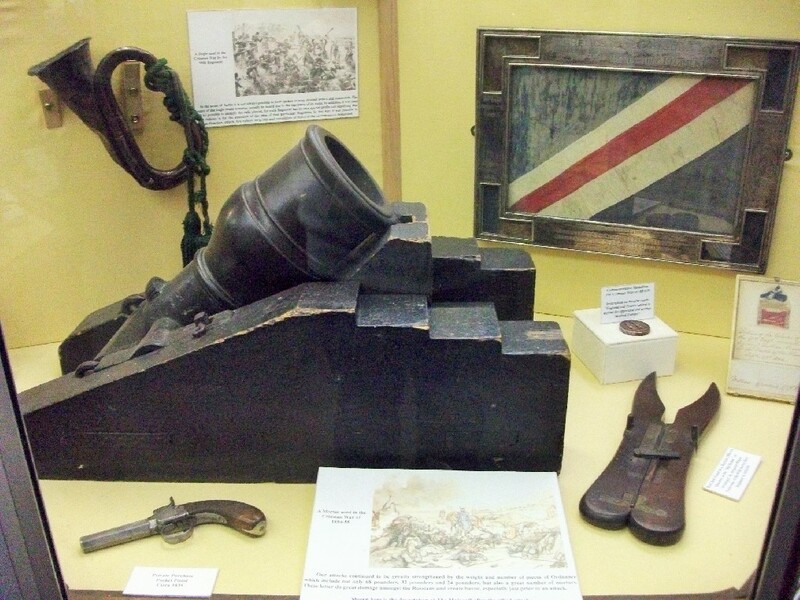 This particular maxim was used by Lt Hadow and his 17-strong detachment of Norfolks on the expedition and he boasted of it being able to fire 450 rounds a minute. The devastating effect upon the matchlock-armed Tibetans, even as they were retiring, seems to have elicited moral discomfort from some British troops. “I got so sick of the slaughter that I ceased fire, though the general’s order was to make as big a bag as possible”, wrote Hadow later. “I hope I shall never again have to shoot down men walking away.” Reaction in Britain to the massacre at Chumik Shenko had been one of “shock [and] growing disquiet”. Magazines such as Punch expressed critical views of the situation where “half-armed men” were being wiped out “with the irresistible weapons of science.” The First World War was only a decade away. Displayed alongside the Maxim, with some poignancy, are the Buddhist religious artefacts and artworks taken during the venture. Having been rather isolated from the outside world, the contrast between 20th century mechanised warfare and an ancient religious tradition is starkly contrasted in this display. Against this industrial military power, the Tibetans were still using flint and tinder pouches for their stone-ball firing muskets, and wielded long swords. 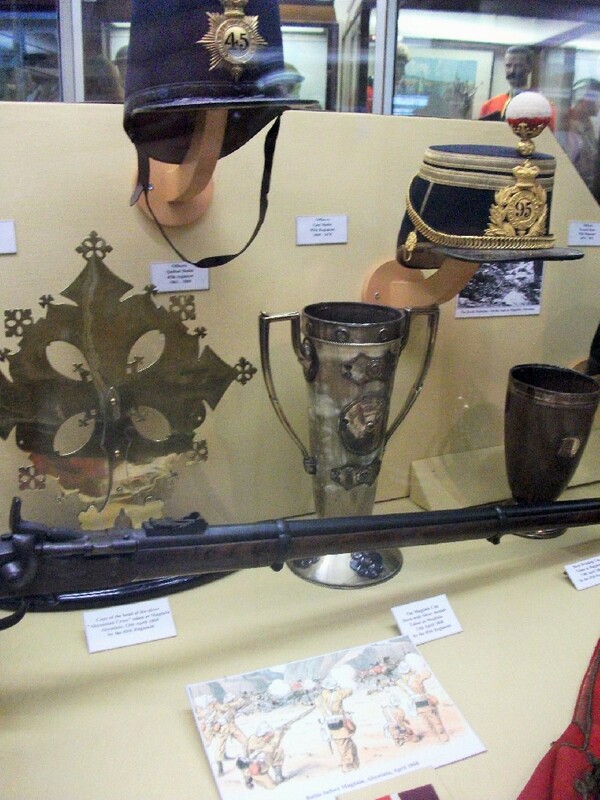 Looting and the collection of exotic artefacts was common practise and not just in the British army of the time. It’s a contentious topic for sure, but I’m grateful that as a consequence I am at least able to see these wonderful and well-preserved objects close up. As a buddhist myself, (yes, a buddhist with an interest in military history – I’m a complicated guy), it’s a particular pleasure. Lt Hadow’s granddaughter, Celia Hadow, transported one looted statue of the Buddha back to Tibet to return to the 14th Dalai Lama himself and BBC Radio 4 made a programme about it called ‘The Return of the Buddha’ in 2004. Tibetan artefacts on display above included a brass statue of the Buddha, two clay teacher statues, a bone prayer trumpet used by Lamas, a prayer wheel, a wooden printing block, and a golden chorten (a model of a religious monument) taken at the battle of Gyantse. A fine Bhutanese dagger in the collection was a diplomatic gift to Lt Hadow from the ruler of Bhutan, Tongsa Penlop, who accompanied the Younghusband Mission. At a different part of the castle was a gallery entitled ‘Treasure, Trade and the Exotic’, which I discovered included one more looted exhibit; a ceremonial bone apron. Although the British invasion caused destruction and harm to Tibet, arguably this seems to pale in comparison to what the country has suffered, and continues to suffer since then. Chin drum taken in Burma, 1889. Quilted woollen boots of Cpl Green, Tibet expedition 1903. The cold of the Himalayas were a problem. Ornate Turkish sandbags and drum taken at Gaza, WW1. 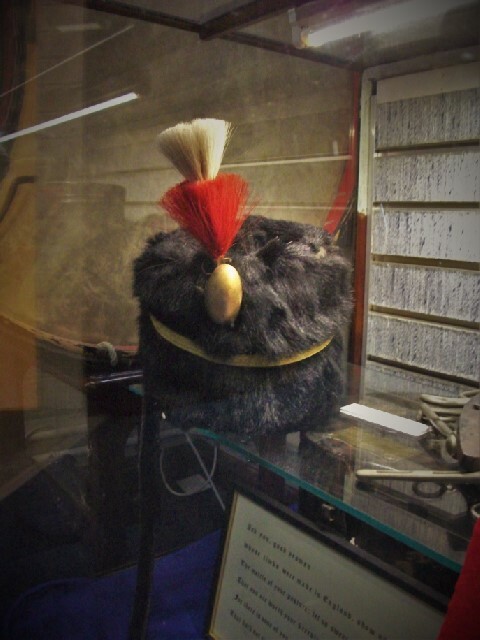 A great example of a Wolesley helmet from the meospotamian campaign in WWI. The yellow and black flash was particular to the Norfolks. A visit to the castle shop yielded an excellent book on The Royal Norfolk Regiment by Tim Carew, which I’ve been eagerly devouring ever since. From this history, it seems the regiment was subject to numerous disasters and bouts of being virtually wiped out! Disease (mostly), storms at sea, extreme privations, or incompetent generalship were sometimes to blame, but never was it as a consequence of the bravery or competence of its soldiers. Britannia must have been proud of her sons. That visit has whetted my appetite for another museum venture. I’m having to travel farther afield to find new collections but they’re often worth the effort when I do. In the meantime, now my holiday is over I will be soon back once more to the modelling. 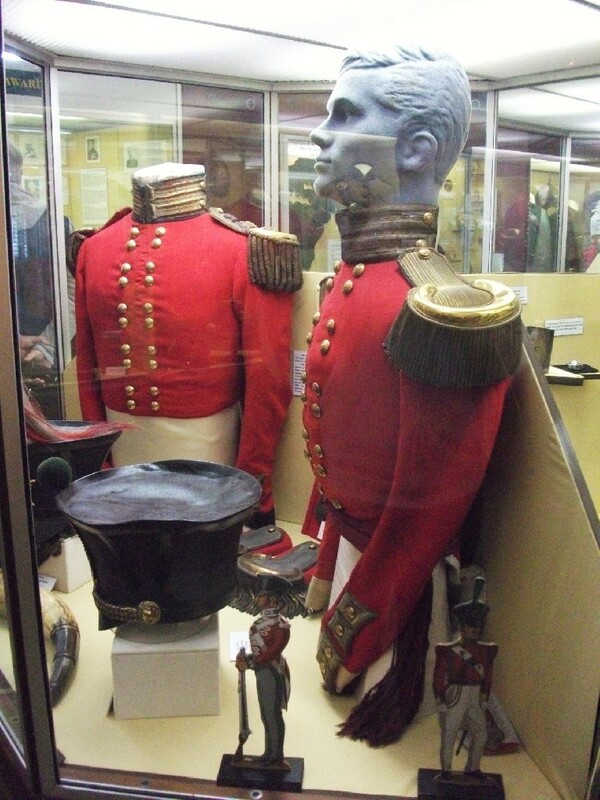 The Leicestershire Yeomanry collection is based in a museum at Loughborough’s Carillon. The Carillon is an imposing war memorial built during the early 1920s in the wake of the carnage of the First World War. On the outside of the tower are listed the names of the fallen, whilst inside is housed a military museum and a carillon. A Carillon is an instrument consisting of over 24 bells (played with the fists!) usually housed in some kind of bell tower. These are a particularly common feature in the Flanders region of Belgium where in the First World War much of the British army had fought and died, including many local men in the Leicestershire regiments. The bodies of many of these locals who’d been killed during the war remained buried, or missing, over in Flanders far beyond the reach of many relatives. 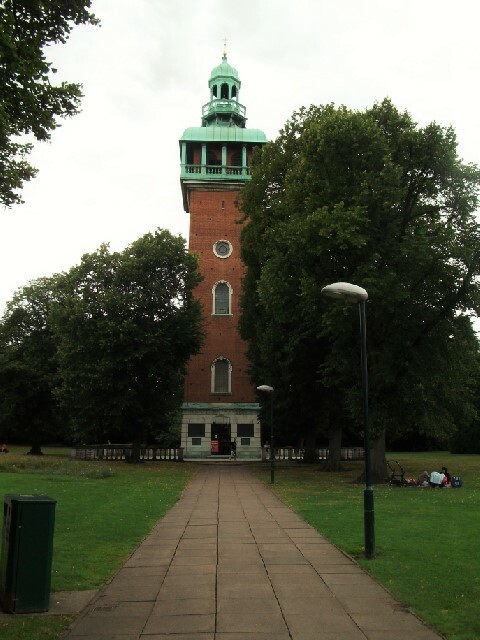 Loughborough’s Carillon building was an admirable memorial attempt to at least bring the sounds of Flanders to the townsfolk of Loughborough; a clever connection made to another land where local men had been lost, never to return. It is within this local landmark tower that the Leicestershire Yeomanry collection is housed. 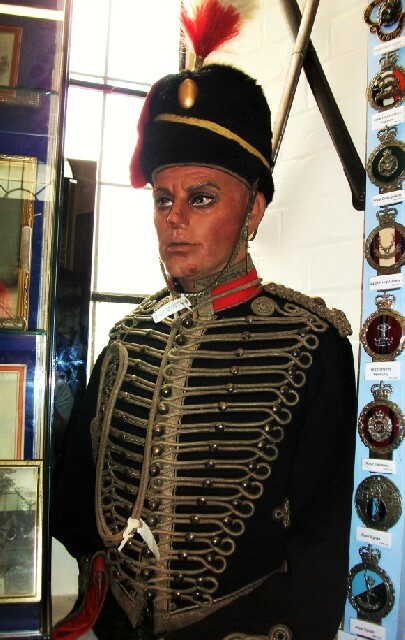 A model of a trooper in the Leicestershire Yeomanry. It’s been longer than I care to remember since I visited the Carillon and I really can’t believe that it’s taken me so long to revisit. The floor which features the Leicestershire Yeomanry collection is accessible up a tight spiral staircase which ultimately can lead visitors right up into the belfry itself in the very top of the tower. 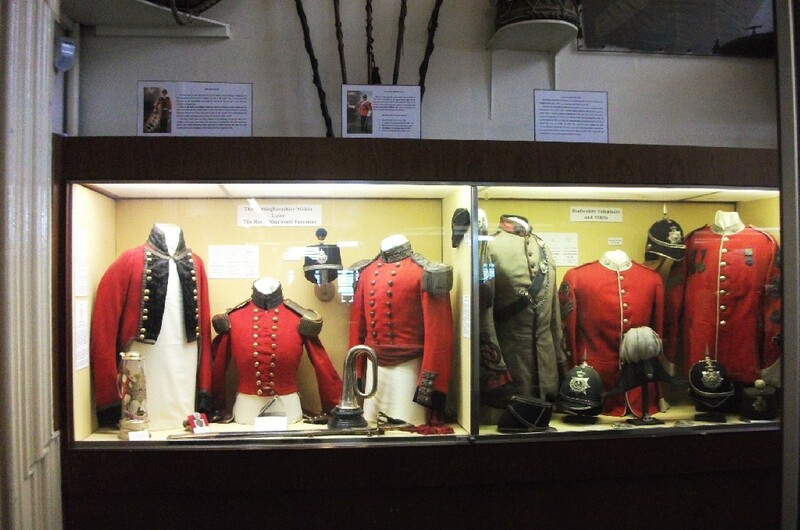 The Yeomanry room is small but effective and features lots of artefacts of interest. 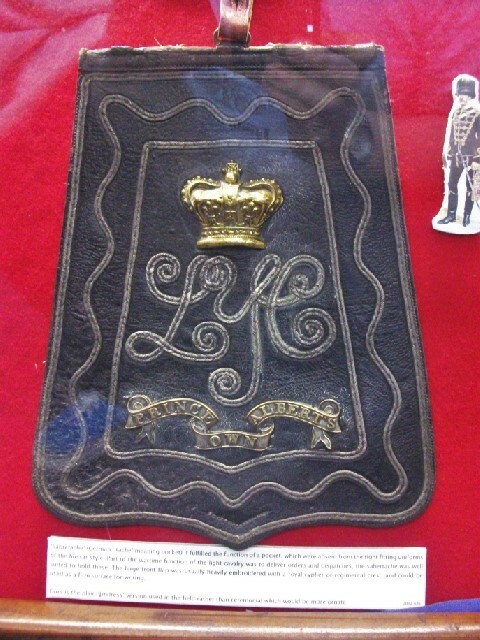 Raised in 1794 at the Three Crowns Inn in Leicester by Sir William Skeffington, the regiment was a response to the threat of invasion by revolutionary France. 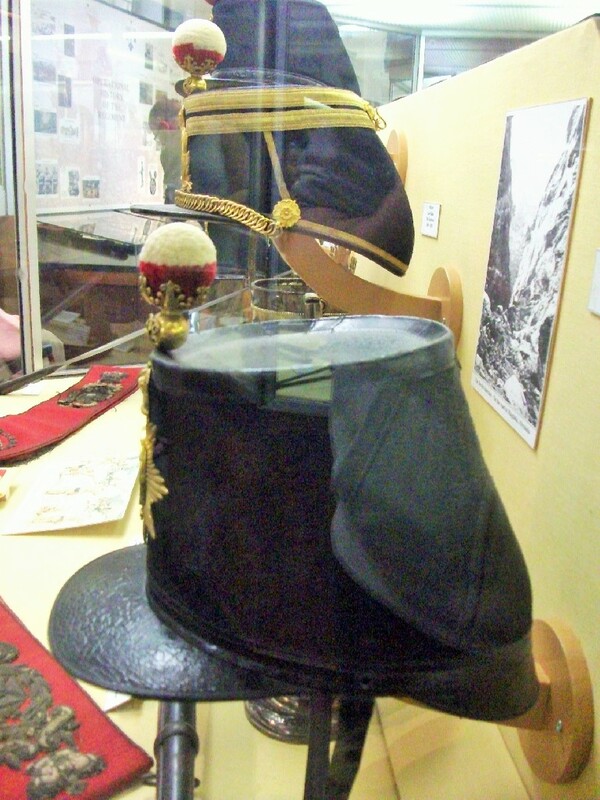 At the time of this emergency, the Yeomanry would have worn the Tarleton helmet common to regular cavalry of the time, and one example was on display. 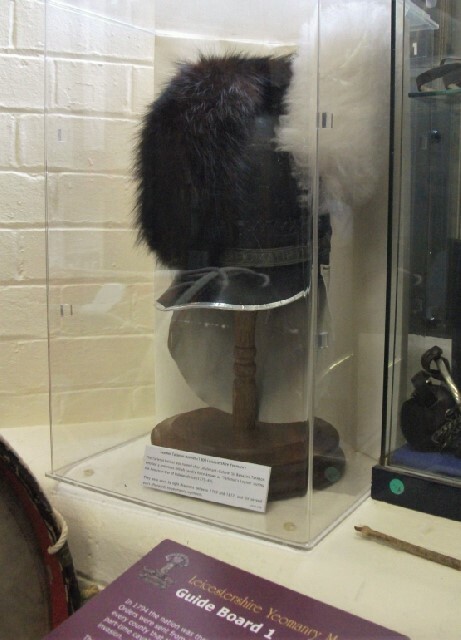 An example on display of the early Yeomanry’s Tarleton helmet. 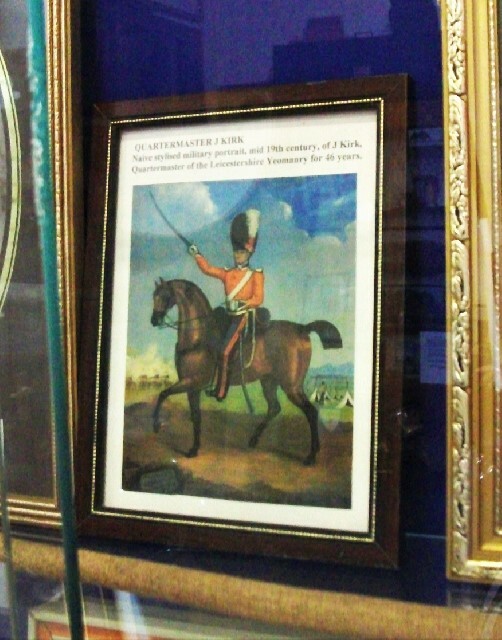 ‘Naive and stylised’ contemporary painting of a long-serving Quartermaster in the mid-1800s. Notably, he still wears a Tarleton just before the change to 1850s style shakos. 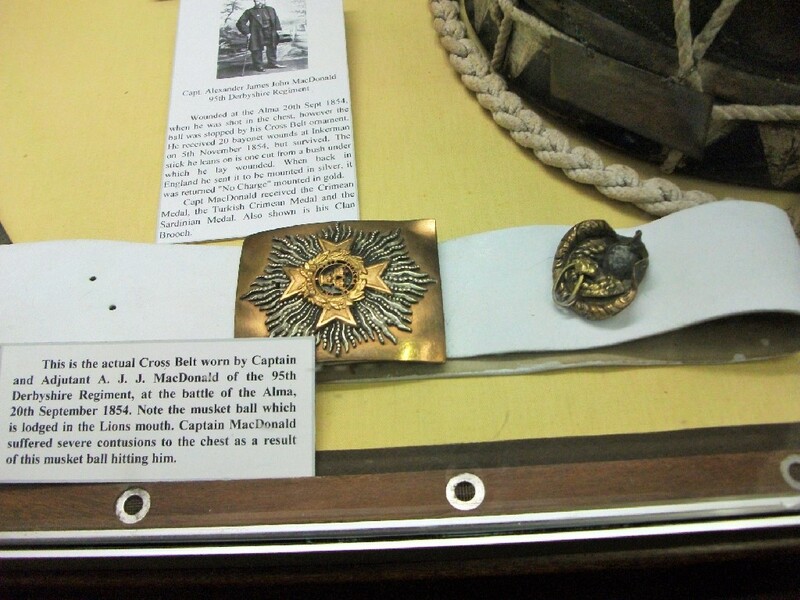 The Yeomanry went through a number of headgear changes which is explained in detail on the excellent Prince Albert’s Own Yeomanry website, before settling for a while on the 1873 busby. A busby of the PAOLYC. The Yeomanry were formally named “Prince Albert’s Own” Leicestershire Yeomanry Cavalry (PAOLYC) in 1844, in honour of Queen Victoria’s consort. 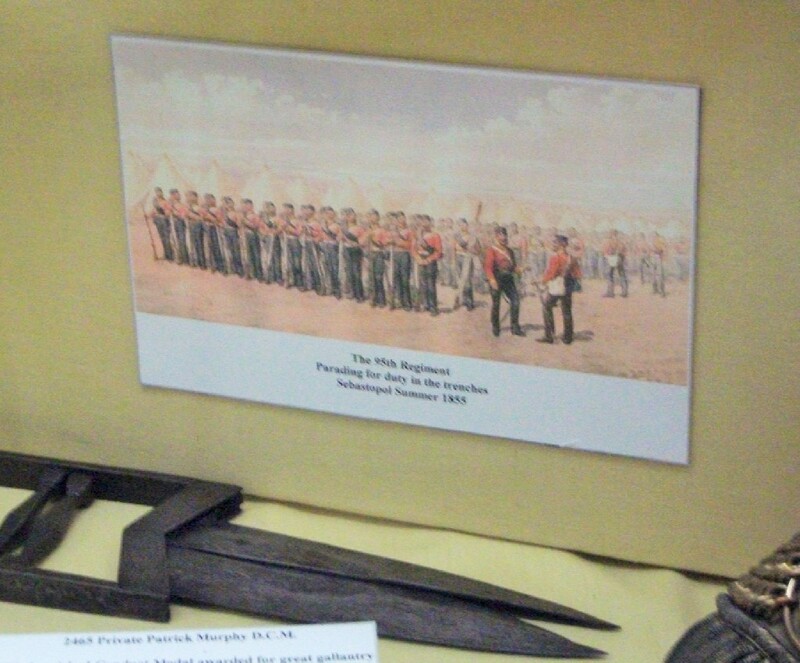 As a home service force, the regiment was mobilised to enforce public order on a number of occasions. Tackling civil disturbance was never glamorous work – the most notorious example being the Manchester Yeomanry’s debacle at the Peterloo Massacre. Until their contribution to the Boer War effort, public feelings about yeomanry forces could be mixed. 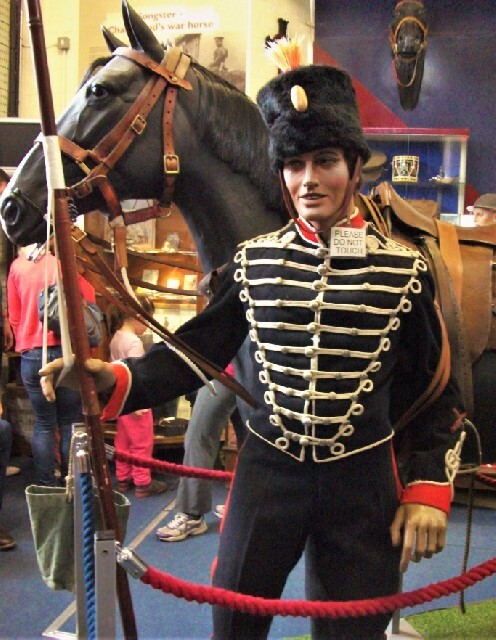 However, not being exposed to the same harsh realities of overseas warfare as regular cavalry meant that yeomanry regiments were able to be more decorative and colourful in their uniforms right up into the 20th century. 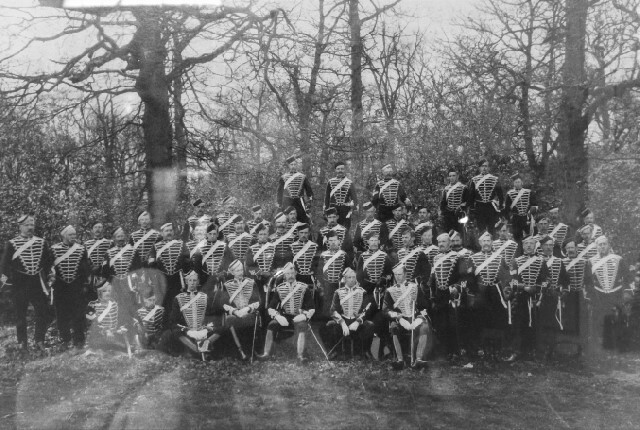 In the latter part of the 19th century, the PAOLYC were dressed a dark blue uniform of hussars with the aforementioned busby for headgear. Models and photographs of this uniform were on display. 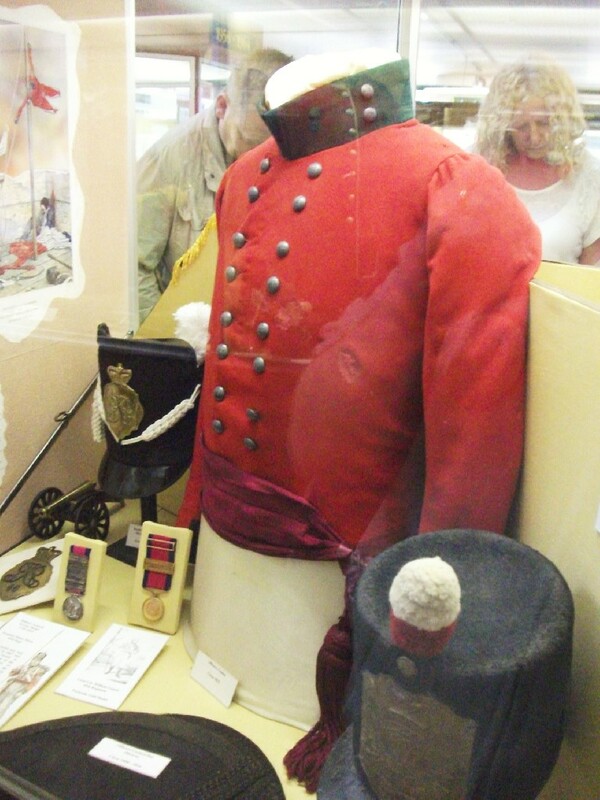 Officer’s uniform of the PAOLYC. Photograph of C Squadron of the PAOLYC, 1899. They are wearing informal forage caps instead of busbys. 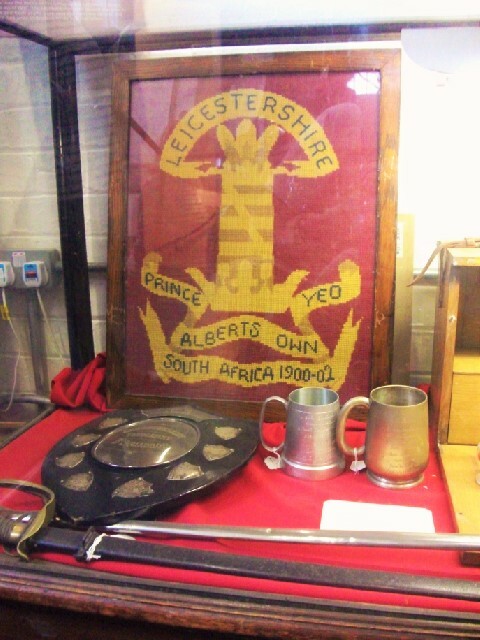 Ornate Sabretache with the letters LYC for Leicestershire Yeomanry Cavalry and the regiment’s prefix “Prince Albert’s Own” in a scroll underneath. 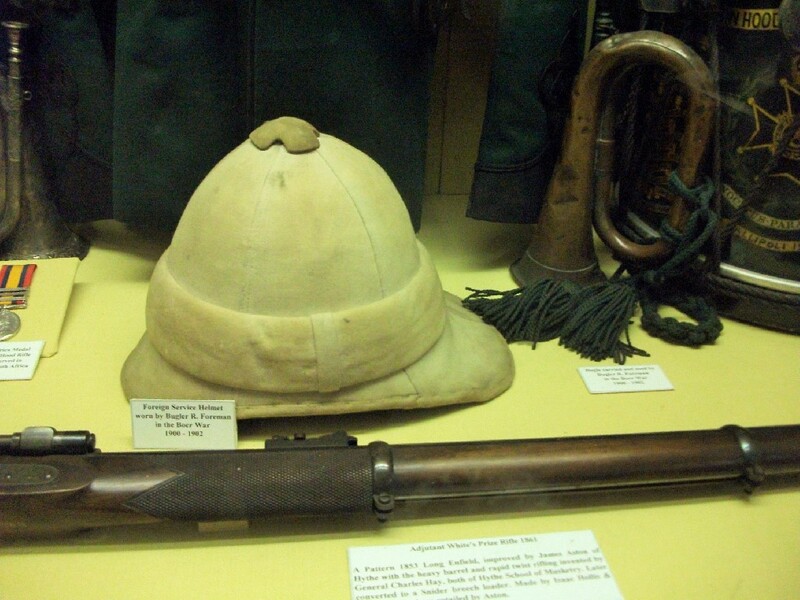 Being intended strictly for home service, yeomanry forces across the country gave volunteers to the newly formed “Imperial Yeomanry” for service in the Anglo-Boer War at the turn of the century, the PAOLYC itself submitting two companies. There was much more to see in the museum on the ground and second floors, comprehensively covering the first and second world wars. Requiring some effort, the top floors gave access to the carillon and its bells for which the great composer Edward Elgar wrote “Memorial Chimes” as the inaugural piece of music. Finally, at the very top (for those without a ridiculous fear of heights like the author), a balcony offered great views over the entire county. 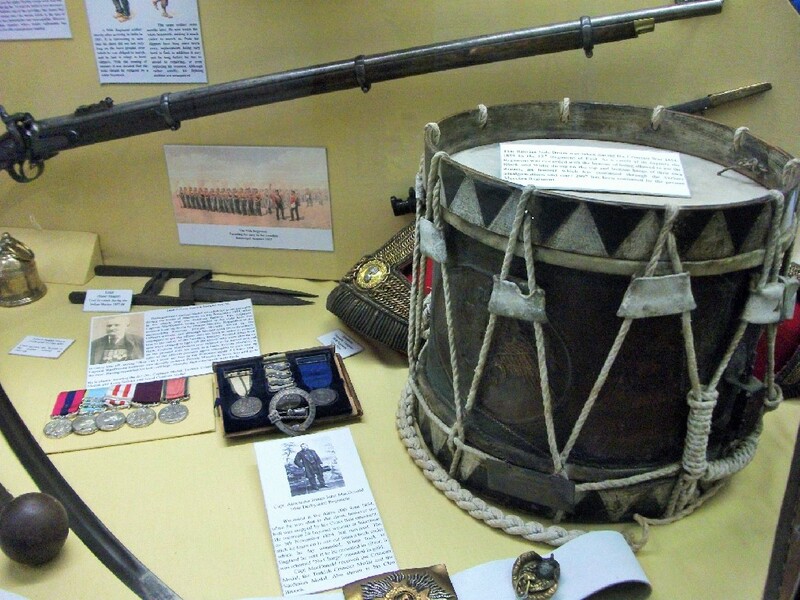 Note: A comprehensive and informative website dedicated to the Leicestershire Yeomanry can be found here and, as with the Carillon Museum itself, is well worth a visit. See also Arnhem Jim blog for a little more info on Richard Simkin’s Yeomanry prints, an example of which is at the top of this post and also in my own possession.